Christopher Columbus departed from Spain on August 3, 1492, on a fleet of three ships: the Nina, the Pinta and the Santa Maria. 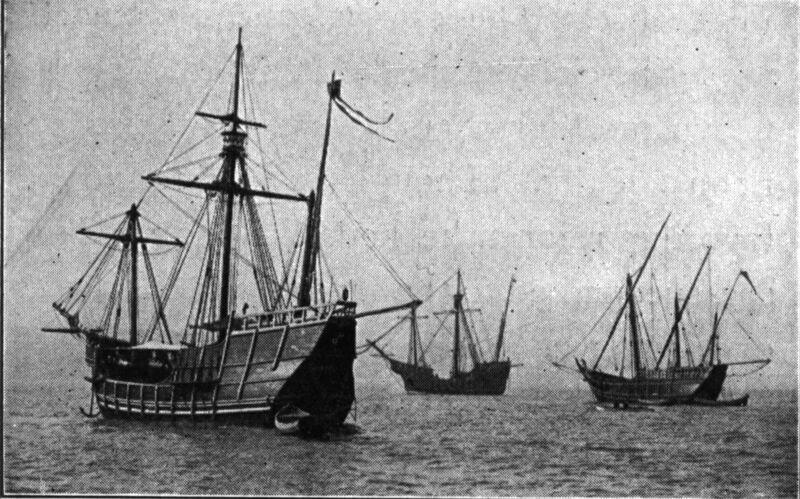 Nina and Pinta were both smaller, sleeker ships, called caravels. Santa Maria was a larger, round-hulled ship, called a nao. Columbus himself sailed on, and piloted, the Santa Maria. Together, the three ships carried about 120 men, equipment and supplies. Of the three ships, only the Santa Maria was built with a deck, and it was a much slower, heavier ship, with a keel that was about 115-feet long (35 meters). Both Nina and Pinta were about 50 feet long (15 meters). All three ships were armed. The Nina sailed under Vicente Yanez Pinzon, and the Pinta sailed under his brother, Martin Alonso Pinzon. The goal of the voyage was to find a new passage to Asia. After a few “wrong turns”, the crew landed in the New World, on one of the Bahama Islands, on October 12, 1492. The island was later renamed San Salvador by the Spaniards. In November, the Pinta disappeared in a strong wind. On December 25, 1492 (Christmas Day), the Santa Maria ran aground and was completely destroyed. Later, in January, the Pinta rejoined the Nina. Columbus returned to Spain on the Nina, arriving in March of 1493. The Pinta arrived soon afterwards. Columbus always believed that he had arrived in the Indies, never fully realizing the extent and importance of his discovery.